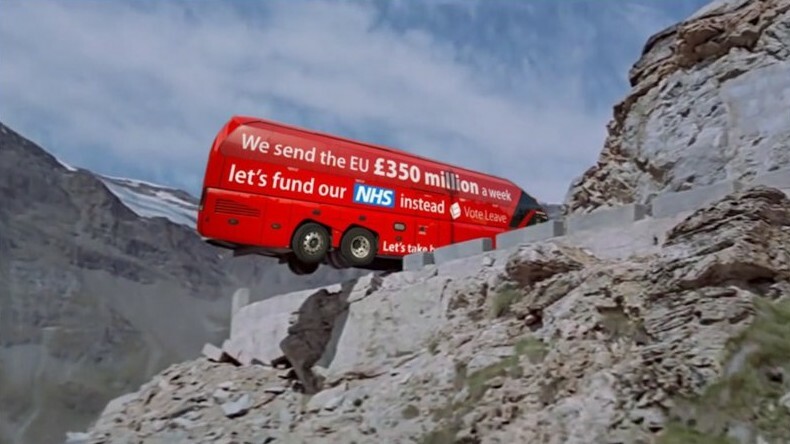 Over a cliff: The Brexit bus, with all its claims of a new Golden Age for the UK, teeters on the edge. Boris Johnson, in the driver’s seat, says: “Boys? I’ve got an idea.” Then Philip Hammond walks up and pushes bus, Boris and Britain over the precipice. Probably because there are very few people around with the economic expertise to know that outrage is the proper way to respond. Philip Hammond’s Autumn Statement – his first real contribution to UK politics as Chancellor of the Exchequer – was a long admission that the Conservative Party has ruined the country, hidden behind an attempt to blame it all on Brexit. No, Philip; your party’s policies are responsible. So it seems the UK is going to have to borrow an extra £59 billion – just to cover the cost to the country of Brexit. This means the claim on the side of the famous red Brexit bus, that we could put £350 million a week into NHS services was definitely a lie. Let’s not beat around the bush any more – it was a lie and the people who made that statement are liars who cannot be trusted with anything. Oh – but Boris Johnson, one of the arch-liars, is now Foreign Secretary and has a huge responsibility to deliver the best possible exit from the European Union for the population of the UK. Honestly, how do you think that’s going to work out? We now know there will be less money available for the NHS and other public services than before, due to lower productivity growth (because foreign countries aren’t buying from us) and – yes – lower immigration. Your wages and prosperity will suffer like never before, because of this. But I bet your right-wing neighbour still thinks immigrant-bashing is a worthwhile activity. And all as a result of the vote for a Conservative Government last year. It is worth emphasizing, as many commentators have, the almost-complete failure to mention the National Health Service or provide any more money for it, even though it is in a funding crisis of horrifying proportions. Mr Hammond says announcements about extra funding for the service have already been made, ignoring the fact that his government has not provided enough. Perhaps one reason for this is the pitiful increase in public investment announced by Mr Hammond, at a time when interest rates are at an all-time low. There will never be a better time to borrow money and invest it in the UK’s infrastructure, but instead we’re getting 0.3 or 0.4 per cent of GDP, in each financial year leading up to 2020 – slightly more than from New Labour in the years before the financial crisis. This tells us – although Mr Hammond will never say it aloud – that the Conservatives are continuing their squeeze on public services, started back in the dark days of the Coalition Parliament. One might say it is all part of the plan to take everything away from public hands, as started by Margaret Thatcher and her cronies back in 1979 – if only one had the experience and understanding to see that far. There’s more – we could discuss the hidden policy not to increase fuel duty, that throws out all the economic predictions but gives the Tories a favourable headline in their poodle press; or we could mention the new fiscal rules which set the scene for panic cuts in public investment as we approach the now-fixed (rather than rolling) date for the deficit to be cut back to a new level set by Mr Hammond. But it is all too depressing, really. Someone recently said that, with a May as prime minister and a Hammond as chancellor, all we need is a Clarkson for the UK’s government to emulate the former Top Gear presenting team, now relegated to internet TV on their Grand Tour. It is true that Clarkson once considered standing in the 2015 election. Some might consider that a good idea – a brand behind which to market the UK’s flailing government. But let’s be honest: Clarkson, Hammond and May were successful because they presented themselves as three petrol-headed idiots. With May, Hammond and Boris Johnson in the UK’s driving seat, we don’t need any marketing. We already know they are idiots. Sadly, we also know that their calamities won’t just be television entertainment – we’ll have to live with the consequences. But the response to the Autumn Statement has been muted. Some have even claimed that John McDonnell was wrong to challenge it by demanding more investment. This is because we do not – as a nation – know enough about economics. Otherwise we would be on the streets in front of Parliament, right now, demanding a change of direction – or a change of government. It amazes me that many people still believe that Tories have some sort of gift for economic competence. It is something which has puzzled me for some decades because their record is abysmal. I have always assumed that it is decades of misleading and dishonest propaganda. The books can never be balanced! Currency is created, so when the tories or anyone says there is “no money!” They are lying! It is in possible to pay the bank of England what we owe! And the tories know this! These are cruel people allowing disabled people to die based on a lie! Truly terrible. I think you might have pointed out before, that if the government borrowed, gave much more money to councils, who in turn could set up the services that were stolen from the public. Then people would be working, earning money and paying taxes, wages could go up and the taxes could be flowing into the NHS. I am probably totally wrong, I often am, but I wasn’t furnished with much education, Though I have now gained a GCSE and next year I am going to do “Access into Law”. We should all be up in arms, the Tories Dont know anything apart from killing the sick and disabled and ripping the life out of BRITAIN, OUR HOMELAND. Sorry to write this as a comment but you don’t provide a contact email. I was wondering if you and your readers would be interested in our new book, Righting Welfare Wrongs, which combines accounts from our stalls outside the jobcentres with contextual analysis and discussion of how we can fight back. It has been published by Commonweal and can be ordered from their website for £10 plus postage and packing. They also have a free to download e-book version – see http://allofusfirst.bigcartel.com/. Here is the review of the book from the Morning Star: https://www.morningstaronline.co.uk/a-319d-Fighting-back#.WDgoNbKLTcs, and my article about it from Common Space: https://www.commonspace.scot/articles/9752/sarah-glynn-anger-over-i-daniel-blake-needs-turn-action-heres-how-it-can. If it were not for the ruination of the country, yes, it would be funny. We have what can only be described as morons in charge, morons who are in denial, or just playing it out until the end of term. Mays appearance and pre budget speech was visibly fraught, many must have noticed the look of anguish on her face, I must admit, though I’m not a fan of hers, I was afraid she was on the verge of breaking down. How much longer she can carry this charade must be first in her mind. The Tories are on the verge of losing credibility even among their own MP’s, I suspect another change of leader is on the cards, and lets face it, there are enough idiots around to pick up this chalice. I can only comment Mike, that I agree with every word you have written. And, if the media moguls who run our daily rags maintain their grip on the dissemination of news and views most people will never really understand economics. What is more likely, is that they will believe they know enough about economics to make choices; as does every housewife when she tots up the weekly shopping bill (Cameron and Osborne, et. al 2010.). “G4S. Major shareholder TMs husband”, that’s interesting, if true. It isn’t. I meant to edit it out but accidentally hit the ‘approve’ key instead.